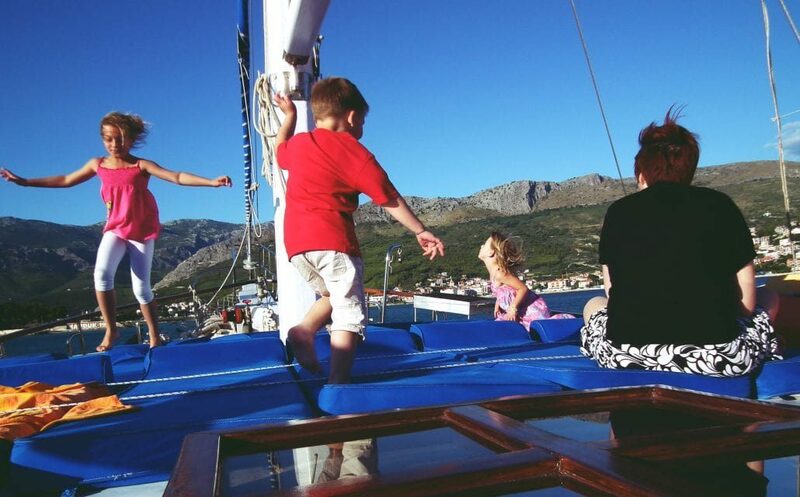 Family Turkey cruise that will keep your kids amused! Right from the start we have to say this: Your kids come first! 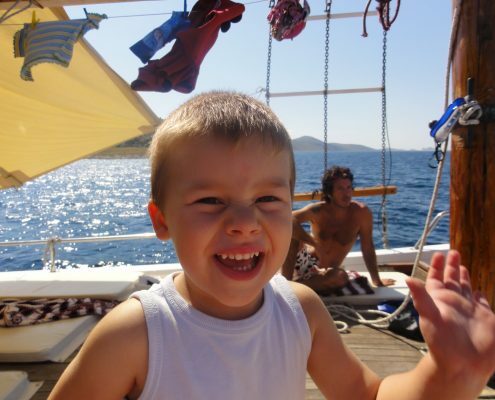 Your kids on gulet are a priority to you and to us! 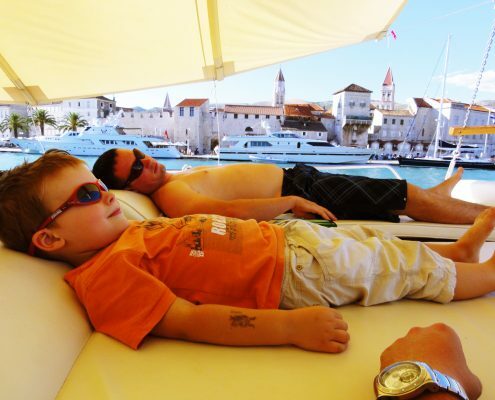 Your own comfort surely isn’t the first thing that comes to mind when planning a family cruise. Naturally, you might have many questions worrying you, regarding safety, Turkey as a family destination, activities for kids, their enjoyment, comfort etc. In this post, we’ll try to answer as many questions possible so if you plan to travel with kids on board you will be prepared! 1. Is it safe for small children? 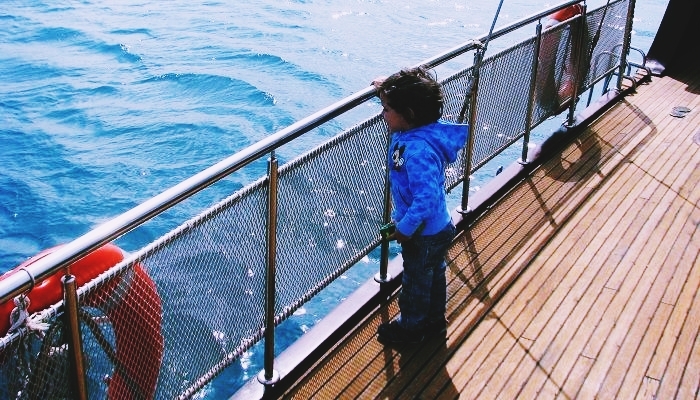 When you have small kids first thing that comes to your mind probably is safety on board. There is no age limit for children that can come and join the trip. 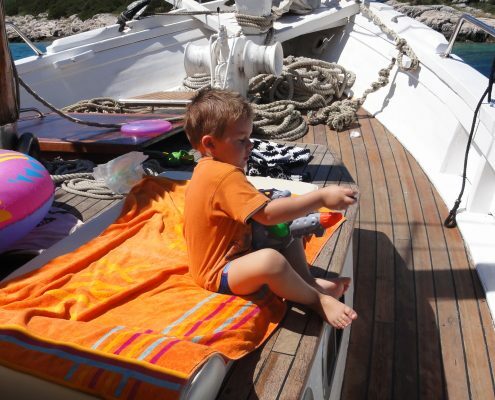 However, parents’ responsibility is, like always, to watch over the kids while on board or on the shore. Firstly you’ll inform us how many children you have and what their age is. 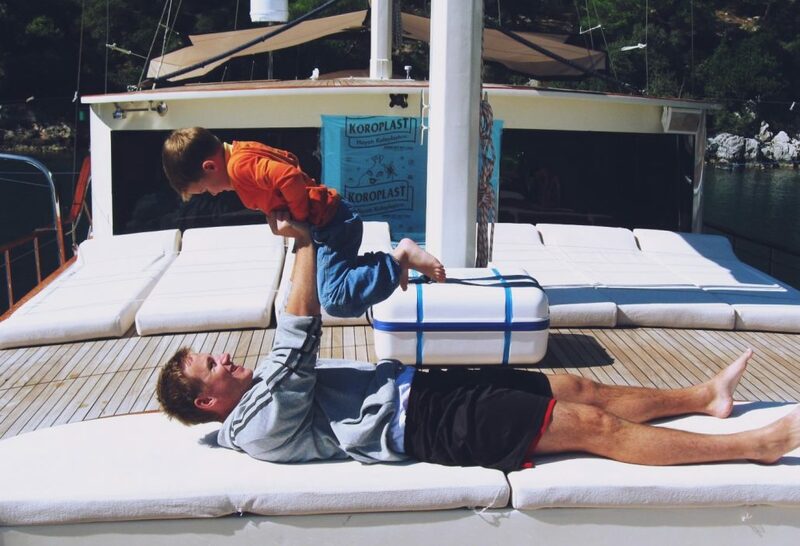 Once you start planning and searching for perfect gulet for you and your family we will make sure to match you with one that includes a safety net that will protect your child/children from falling. 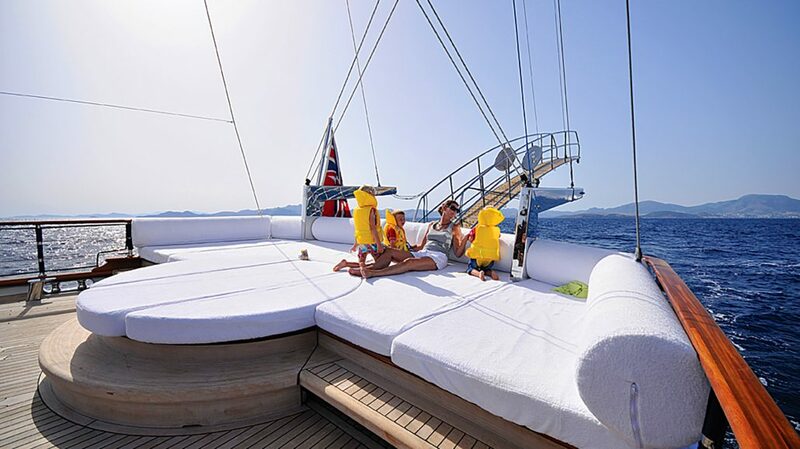 Additionally, we will provide you with gulet that has a larger salon and wider more spacious comfortable ship beam. Which means during your Turkey cruise your kids will be able to play safely on the deck or they can have their fun games in the salon. You can also consider booking gulet that has a large salon with TV. So this way while the captain takes you from one location to the other children will be safe in the salon watching cartoons. This time you can use for your leisure time, enjoy and relax on the deck. 2. Does the crew speak English? English speaking, friendly and patient crew is quite important! 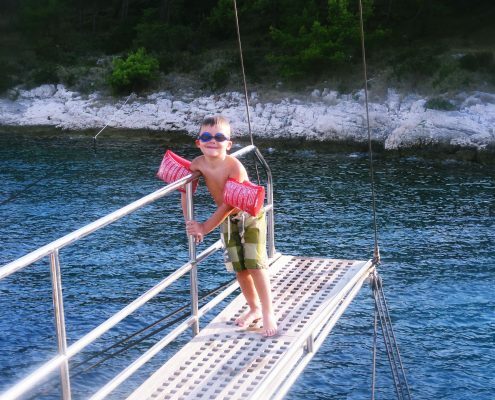 Not only for the sake of your kids but for the sake of your whole cruise experience as well. With fluent English crew, your children can easily communicate their needs to the crew in case that in that time you are busy. Having a good crew with lots of experience is even more important than gulet itself. 3. Will small kids be bored? The short answer is; no! But here are reasons why is that so. 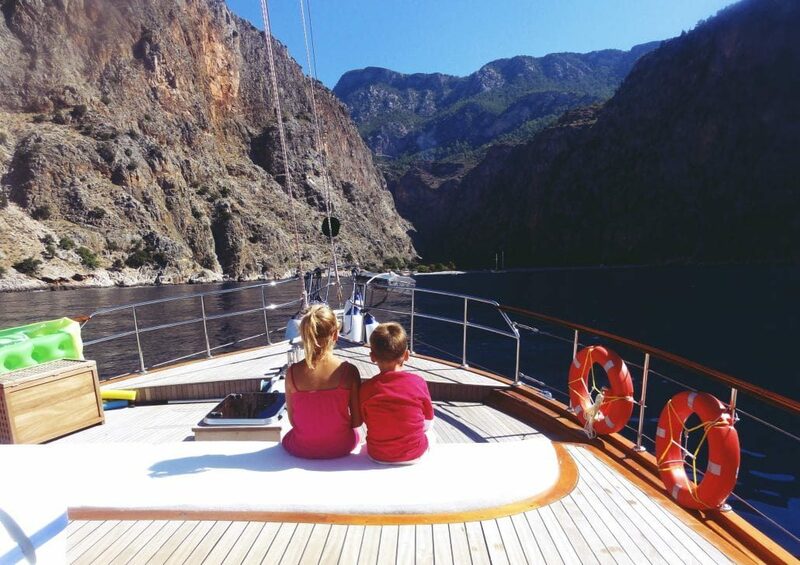 When choosing a gulet and planning itinerary we’ll make sure to match you with something that will make you and your kids happy and comfortable. Small kids will have plenty of places on deck for a carless safe play like we mention you can choose a saloon with large TV so they can watch cartoons or children movies. A kids-size water sports gear will be included too. Internet access music and the sound system is also available on gulets, some even offer console games are another features. The crew will provide you with a detailed explanation of all the ancient sites, tourist spots and cultural places which you’ll visit on your cruise. Onshore and water activities may include historical tours adapted to the children, they can have fun in the sea with you, swim, go to the many of the beautiful beaches Turkey has to offer, etc. If your group includes teenagers then you know if they are occupied that you will also be happier and more relaxed. Your itinerary should be flexible! 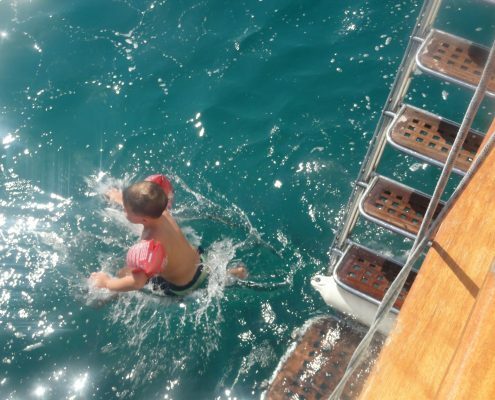 But more importantly, it should be organized in a way that your kids can get on and off the gulet on several occasions for let says, swim stops to have a fun time on their own. We and your Captain will help you with finding those places that should be very safe for them and you don’t have to worry. Turkey offers a lot of places for swimming, snorkelling, and other water sports that are quite important for your kids fun. 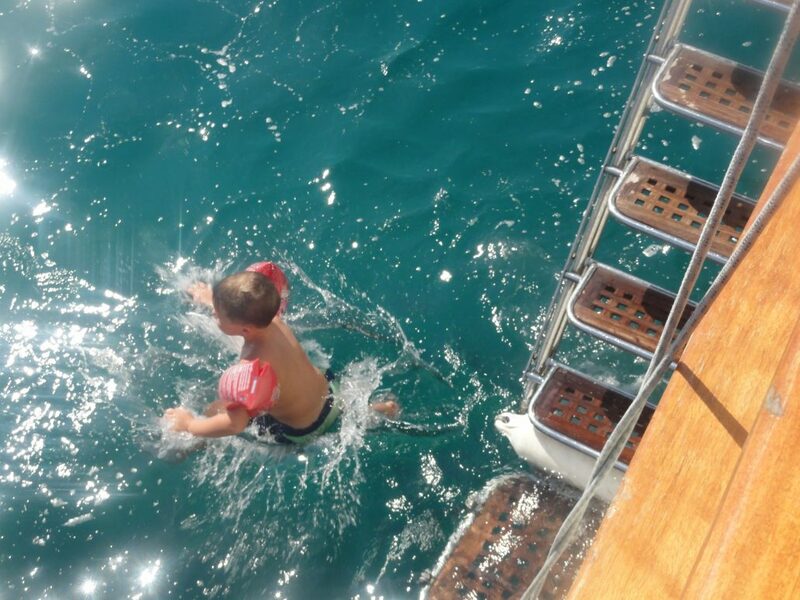 Your gulet has to have as much water sports options as possible. 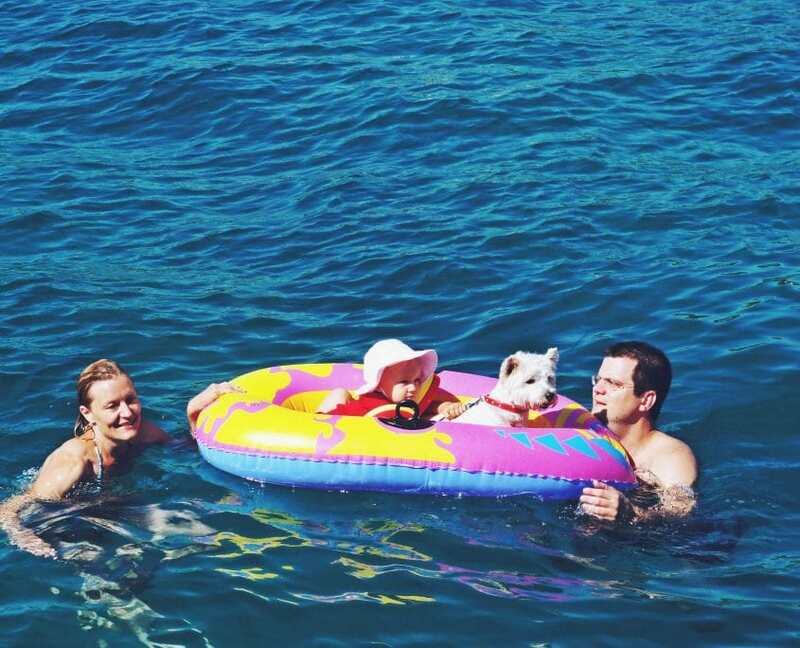 Most of the gulets have all this basic equipment on board, but there are also more advanced water toys such as Water skiing, donut ride, banana ride, wakeboard, jet ski, etc. Some of the equipment can be used by kids only with parents approval. Salon with a TV and other technical equipment such as iPod plugins and a good music system will also come in handy. It is important to check the availability of Wi-Fi internet connection once you start looking for perfect guilt. However you might believe that it’s going to be hard to get your kids interested and amazed by nature, but you would be surprised! If you take kids to the right places they will enjoy in nature and warm clear sea while their phones will be out of reach. A smile tells it all! Gulet Queen Lila from Turkey surely won’t disappoint you. 5. Why is Turkey good family cruise destination? Turkey really has so much to offer to her numerous visitors, especially in recent years when it made a big comeback! 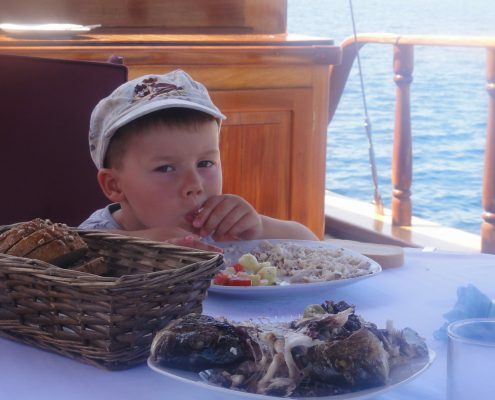 Spending your holidays on a gulet cruise with the whole family can seem challenging at first, but if planned early this will a memorable experience for all on board. Usually, Turkish gulet cruises come along with professional crew members who do their best to ensure the safety and enjoyment of the guests. One extra thing that makes Turkey a great place for a cruise is that in Turkey there are more than 1.000 gulets for charter to choose from! When you see that number you might think that the choices are a bit overwhelming… However, if you know what you are looking for you will get the best deal and the best gulet for your group! 6. 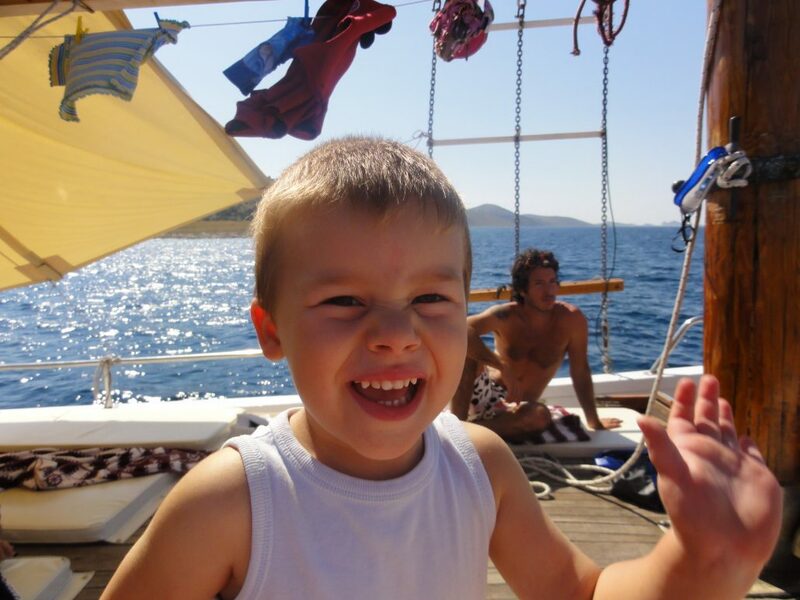 Where will you cruise in Turkey so that kids also feel happy? On Turkish cruise, you and your kids will get to experience the gorgeous scenery of the coastal area and preserved nature. You’ll discover the rich history and culture and introduce your kids to the region and its traditions. You’ll also get the chance to swim in crystal clear sea and enjoy on some of the most beautiful beaches. During your cruise to the different destinations, Captain will try to offer a special chance to catch a glimpse of dolphins in the see, which would be a fun encounter for a whole group. 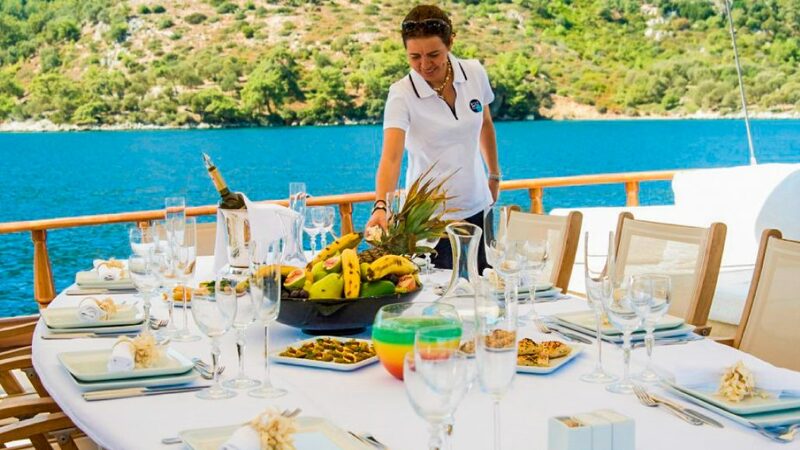 Aside from the exciting tours and the relaxing leisure time on board, the gulet cruise will also provide appetizing beyond delicious food that will be prepared by your Chef on board. Expect fresh quality food, beautifully decorated dishes full of aroma. 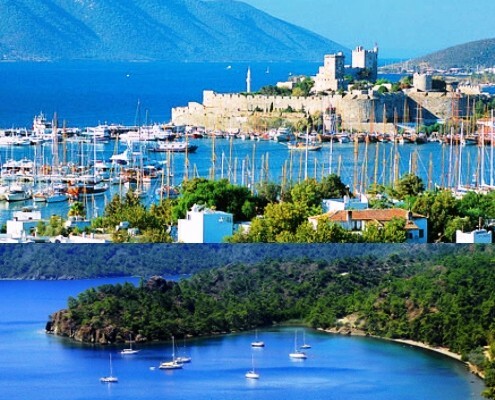 Bodrum: Where gulet was first made! It’s very had to decide wether this city is more beautiful during the day or during the summer nights… Truly a gorgeous town and a home to the Castle of St. Peter, which contains the city’s most remarkable museums. What is fascinating is that the ruins of one of the Seven Wonders of the Ancient World, the Mausoleum at Halicarnassus, can also be visited in Bodrum. There are several summer festivals and other events, so it’s sure to say, you won’t be bored here. 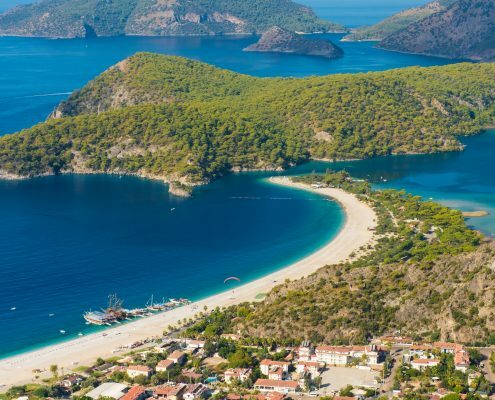 There are many attractions to see and many activities to do in Fethiye that you could easily spend one or two days here. Fethiye is full of history and culture where you can take your kids for exploration of Roman Amphitheatre and mysterious Lycian Rock Tombs. You’ll also find many beaches with areas for sunbathing and swimming. A city is a popular place and we are sure that you and your kids will be pleasantly surprised by the kindness of the residents and the beauty of the town. This is a lively city that started with humble beginnings as a fishing town and now it is one of the most popular destinations, and main shopping and trading locations in Turkey. 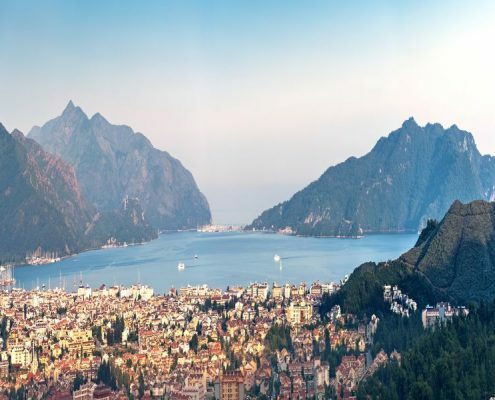 Here you’ll find beautiful resorts, shop for souvenirs, try delicious dishes from exquisite restaurants… As the night falls and someone is there to watch over your kids, you have to know that Marmaris has a legendary nightlife! Discover more destinations and cruise possibilities right now! Explore and start planning now! Luxury small-ship cruise the Greek islands 2019 First time cruising Croatia – essential facts for travelers!